Our previous studies detected focal disruptions in myoepithelial cell layers of several ducts with carcinoma in situ. The cell cluster overlying each of the myoepithelial disruptions showed a marked reduction in or a total loss of immunoreactivity for the estrogen receptor (ER). This is in contrast to the adjacent cells within the same duct, which were strongly immunoreactive for the ER. The current study attempts to confirm and expand previous observations on a larger scale. Paraffin sections from 220 patients with ER-positive intraductal breast tumors were double immunostained with the same protocol previously used. Cross-sections of ducts lined by ≥ 40 epithelial cells were examined for myoepithelial cell layer disruptions and for ER expression. In five selected cases, ER-negative cells overlying the disrupted myoepithelial cell layer and adjacent ER-positive cells within the same duct were separately microdissected and assessed for loss of heterozygosity and microsatellite instability. Of the 220 cases with 5698 duct cross-sections examined, 94 showed disrupted myoepithelial cell layers with 405 focal disruptions. Of the 94 cases, 79 (84%) contained only ER-negative cell clusters, nine (9.6%) contained both ER-negative and ER-positive cell clusters, and six (6.4%) contained only ER-positive cell clusters overlying disrupted myoepithelial cell layers. Of the 405 disruptions, 350 (86.4%) were overlain by ER-negative cell clusters and 55 (13.6%) were overlain by ER-positive cell clusters (P < 0.01). Microdissected ER-negative and ER-positive cells within the same duct from all five selected cases displayed a different frequency or pattern of loss of heterozygosity and/or microsatellite instability at 10 of the 15 DNA markers. Cells overlying focally disrupted myoepithelial layers and their adjacent counterparts within the same duct displayed different immunohistochemical and molecular features. These features potentially represent an early sign of the formation of a biologically more aggressive cell clone and the myoepithelial cell layer breakdown possibly associated with tumor progression or invasion. The epithelial component of normal and noninvasive breast tumor tissue is physically separated from the stroma by both the myoepithelial cells and the basement membrane (BM). Myoepithelial cells are joined by intermediate or gap junctions and a number of intercellular adhesion molecules, forming a continuous sheet or belt that encircles the epithelial cells (except at the terminal ductal–lobular unit, within which about 20% of the epithelial cells are reported to be in direct contact with the BM) [1–3]. The BM is composed of a group of fibrous proteins embedded in a hydrated polysaccharide gel, constituting a continuous lining surrounding and attaching to myoepithelial cells via hemidesmosomes and focal adhesion complexes [3–5]. Both the myoepithelial cell layer and the BM layer are permanent structural constituents, normally allowing only the passage of small molecules [1–5]. Due to this structural feature, most tumor epithelial cells have to first pass through the myoepithelial cell layer and then the BM in order to physically contact the stroma. In other words, the disruption of both the BM and the myoepithelial cell layer is an absolute prerequisite for breast tumor invasion. Invasive and metastasized tumors, compared with in situ tumors, have a significantly higher mortality rate, accounting for a vast majority of breast cancer death . This highlights the significance and the implications for the elucidation of the tumor invasion mechanism(s), which could potentially lead to vast benefits and advances in the field of breast cancer treatment and prevention. It has been generally accepted that an upregulated expression of proteolytic enzymes in tumor or stromal cells is the primary, if not the only, cause for BM disruptions and tumor invasion [6, 7]. This theory, however, might not reflect the intrinsic mechanism(s) of myoepithelial layer disruptions for three main reasons. First, neither the normal cellular kinetics nor dynamic alterations of myoepithelial cells during tumor invasion have been well elucidated. Also, no conclusive evidence has shown that the host's own enzymes are capable of degrading its own myoepithelial cells. Finally, the results of proteolytic inhibitor-based human clinical trials for breast cancer treatment and prevention have been very disappointing . While attempting to identify the early sign of myoepithelial disruptions and the precursor of invasion, we have carried out a number of studies focusing on the physical and functional correlation between epithelial and surrounding myoepithelial cells. In one of our previous studies, a double immunostaining method with antibodies to smooth muscle actin (SMA) and to the estrogen receptor (ER) was used to elucidate both epithelial cells and myoepithelial cells . Several focal myoepithelial cell layer disruptions, defined as a total loss of SMA immunoreactivity and an absence of myoepithelial cells, resulting in a gap that is equal to or greater than the combined size of at least three epithelial or myoepithelial cells, were detected in several ducts that were classified as ductal carcinoma in situ (DCIS) based on examination on H & E stained slides. Each of the disruptions was exclusively overlain by a cluster of cells that showed either a complete loss of or a marked reduction of ER expression, in contrast to the adjacent nondisrupted myoepithelial cell layer within the same duct, which was overlain by cells with strong ER expression . Those ER-negative cell clusters and focal myoepithelial disruptions, however, were generally small and not easily identifiable on H & E stained sections . Our subsequent studies further revealed that ducts with a disrupted myoepithelial cell layer had a significantly higher proliferation rate than ducts with an intact myoepithelial layer [10, 11]. It has been documented that the disruption of the BM and myoepithelial cell layers is an absolute prerequisite for tumor invasion, that tumor epithelial cells and their surrounding stromal cells share a similar genetic profile [12, 13], and that the progression of breast tumors is paralleled by a progressive hormonal independence [14–17]. Our findings therefore appear to have several clinical implications. First, those ER-negative cell clusters overlying the disrupted myoepithelial cell layer may represent a newly formed cell clone that is biologically more aggressive than the adjacent ER-positive cells within the same duct. Second, focal myoepithelial cell layer disruption might represent an initial or early sign of the BM and myoepithelial cell layer breakdown. Third, focal disruptions in the myoepithelial cell layer and the loss of ER expression in overlying cells might be correlated events, directly triggering or signifying tumor progression or potential invasion in some cases. Based on these speculations, the present study attempted to confirm our previous observations in a larger number of cases, to determine whether focal disruptions of myoepithelial cell layers is a prevalent event, and whether all the cell clusters overlying focally disrupted myoepithelial cell layers have the same morphological and immunostaining feature. Also, we attempted to carry out a preliminary molecular study to compare the frequency and pattern of loss of heterozygosity (LOH) and microsatellite instability (MI) between ER-negative cells and the adjacent ER-positive cells within the same duct in selected cases. Formalin-fixed, paraffin-embedded breast tissue blocks harboring various grades and subtypes of ER-positive, noninvasive breast lesions from 220 female patients were retrieved from the files of The Armed Forces Institute of Pathology. Serial sections of 5–7 μm thickness were cut and placed on positively charged microscopic slides for immunohistochemical and morphologic assessment. Morphologic classifications were based on our published criteria . Double immunohistochemical staining with antibodies to the ER (clone 6F11) and to SMA (clone asm-1) (Vector Laboratories, Burlingame, CA, USA) was carried out as previously described [9, 18, 19]. A micrometer was inserted into the objective of a microscope to facilitate the reviewing of the whole section and the localization of a specific lesion . Cross-sections of ducts lined by ≥ 40 epithelial cells were examined under a microscope for myoepithelial cell layer disruptions and for ER expression. A focal myoepithelial layer disruption was defined as a total loss of SMA immunoreactivity and an absence of myoepithelial cells, resulting in a gap that is equal to or greater than the combined size of at least three epithelial or myoepithelial cells, or multiple such gaps in a given duct. A focal loss of ER expression was defined as a total loss or a marked reduction of ER immunostaining in cells overlying disrupted myoepithelial cell layers, compared with a strong ER immunostaining in their adjacent counterparts within the same duct overlying the nondisrupted myoepithelial cell layer. A focal positive ER expression was defined as the ER immunostaining in cells overlying focally disrupted myoepithelial cell layers being more intense than or comparable to that in their adjacent counterparts overlying the nondisrupted myoepithelial cell layer. 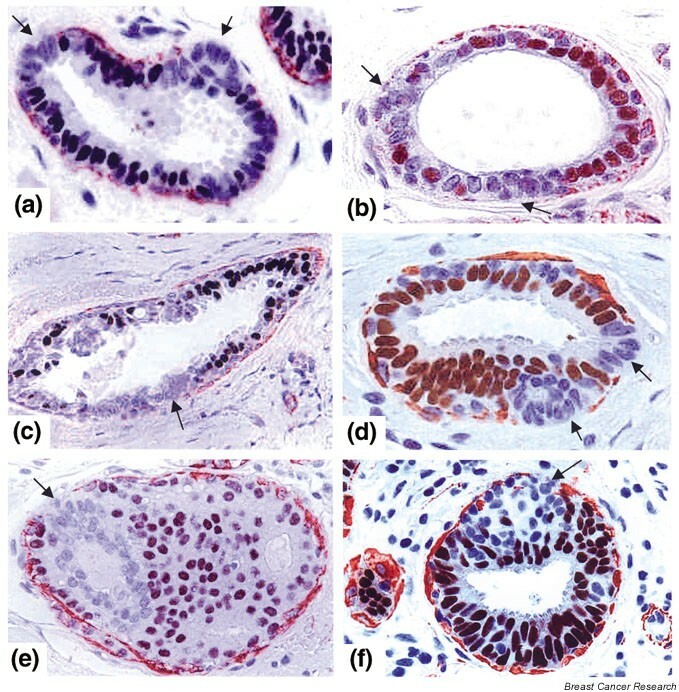 The profiles of ducts containing disrupted myoepithelial cell layers were photographed and reprints were made at a magnification of 400× – 800× for immunohistochemical and morphological evaluation. The frequencies of myoepithelial cell layer disruptions associated with ER-negative and ER-positive cell clusters were statistically compared by the Student t test. The adjacent sections from 20 cases with focal myoepithelial disruptions were immunostained with monoclonal antibodies to cytokeratins AE1/AE3 (clones AE1/AE3; Chemicon, Temecula, CA, USA), to cytokeratin 8 (clone TS1; Vector Laboratories), and to cytokeratin 19 (clone b170; Vector Laboratories) in order to assess whether cells overlying disrupted myoepithelial cell layers are epithelial in nature . Also, the sections in selected cases were immunostained with antibodies to major constituents of the BM-collagen IV (clone CIV 22; Dako Corporation, Carpinteria, CA, USA) and laminin (code number Z0097; Dako Corporation; and clone Lam-89; Vector Laboratories) to assess the integrity of the BM underneath the disrupted myoepithelial cell layers. For molecular analyses, paired ER-negative cells and adjacent ER-positive cells within the same duct, along with clear-cut normal epithelial or stromal cells, were microdissected from each of five selected cases, including one mild ductal hyperplasia and four DCIS or atypical intraductal hyperplasia. To obtain a sufficient number of cells, multiple consecutive sections were immunostained, and ER-negative cell clusters in different sections were microdissected and pooled. Microdissected cells were subjected to DNA extraction and assessed for LOH and for MI with 15 fluorescent-labeled DNA markers (Research Genetics, Huntsville, AL, USA) as previously described . The DNA markers used and their main features are presented in Table 1. Amplified PCR products were subjected to electrophoresis, detection, and comparison with an automated 377 DNA sequencer (Perkin-Elmer, Foster City, CA, USA) as previously described [23, 24]. Of the 220 cases, 14 (6.4%) contained less than three profiles and 206 (93.6%) contained more than three profiles of duct cross-sections, with a total of 5698 profiles available for assessment. Of the total cases and cross-sections examined, 94 (42.7%) cases contained a disrupted myoepithelial cell layer with a total of 405 (7.1%) focal disruptions. Of the 94 cases, 61 (65%) contained one to four disruptions, and 33 (35%) contained five or more disruptions. Disruptions occurred in two forms: a cell-free gap between the two ends of the myoepithelial cell layer, and/or a gap filled with bud-like protrusions of epithelial cells. The size of disruptions varied substantially among ducts, ranging from the combined size of three to more than 30 myoepithelial cells. The frequency of disruptions also varied substantially among cases. In two cases that contained 129 and 130 profiles of duct cross-sections, respectively, no disruption was seen. In another two cases, two of two profiles and five of the seven profiles demonstrated focal myoepithelial layer disruptions. The form, size, or frequency of disruptions seemed to be independent of the size, length, architecture, and overall ER negativity of the ducts, and also of the histological grade of the lesions (Fig. 1). Disruptions of myoepithelial cell layers are independent of the size, length, architecture, and overall estrogen receptor (ER) negativity of the ducts. Paraffin-embedded breast tissue sections were double immunostained with antibodies to ER and smooth muscle actin, and were developed with 3,3'-diaminobenzidine (DAB; black or brown) and 3-amino-9-ethylcarbazole (AEC; red) chromogens, respectively. 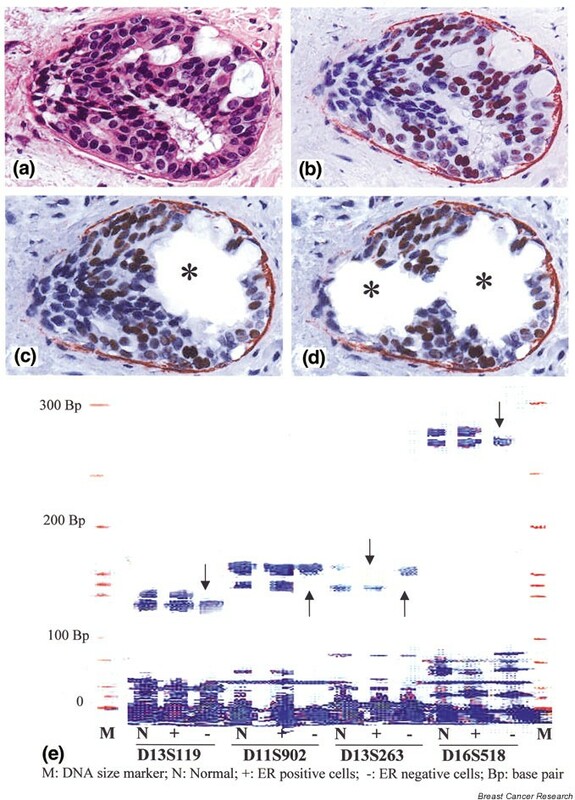 Distinct myoepithelial cell layers are seen in the following structures: (a) a large duct with ductal carcinoma in situ (DCIS), 100×; (b) a long normal duct, 40×; (c) a duct with intraductal hyperplasia, 100×; (d) intermediate grade ER-negative DCIS, 100×. The frequency and pattern of myoepithelial cell layer disruptions, however, were closely associated with the ER expression status in overlying cells. Of the 94 cases, 79 (84%) contained only ER-negative cell clusters, nine (9.6%) contained both ER-negative and ER-positive cell clusters, and six (6.4%) contained only ER-positive cell clusters overlying the disrupted myoepithelial cell layers. Of the 405 disruptions, 350 (86.4%) were overlain by ER-negative cell clusters and 55 (13.6%) were overlain by ER-positive cell clusters (Table 2). The frequency of myoepithelial cell layer disruptions associated with ER-negative cells was significantly higher (P < 0.01) than that associated with ER-positive cells. The number of ER-negative cells overlying the disrupted myoepithelial cell layer varied markedly, ranging from three to more than 100 cells. These cells were generally distributed as clusters, and cells of the same cluster were morphologically similar. A vast majority (> 90%) of the ER-negative cell clusters were small (< 15 cells) and not easily appreciable on H & E stained sections (Fig. 2). The ER-negative cells in some of the larger clusters (> 15 cells), however, showed noticeable alterations in shape and density, morphologically distinct from their adjacent ER-positive counterparts within the same duct (Fig. 3). More than 95% of the ducts contained only one or two disruptions, while a few of the ducts displayed multiple disruptions in the myoepithelial cell layer (Fig. 4). The stromal tissues surrounding ducts with myoepithelial cell layer disruptions were often more vascular and contained more leukocyte aggregates, compared with stromal tissues surrounding ducts with an intact myoepithelial cell layer (data not shown). Myoepithelial cell layer disruptions and overlying small estrogen receptor (ER)-negative cell clusters (< 15 cells) in ER-positive ductal carcinoma in situ (DCIS). (a) H & E staining of a large duct with DCIS, 100×; (b) the adjacent section of (a) immunostained, 100×; (c) a higher magnification of (a); (d) a higher magnification of (b). The myoepithelial cell layer disruption and the overlying ER-negative cells are identified with an arrow. Myoepithelial cell layer disruptions and overlying larger estrogen receptor (ER)-negative cell clusters (> 15 cells) in ER-positive neoplastic and hyperplastic ducts. All sections were immunostained for ER (brown) and smooth muscle actin (red). (a) Ductal carcinoma in situ, 100×; (b) two small ducts with atypical intraductal hyperplasia, 100×; (c) a hyperplastic duct, 100×; (d) two hyperplastic ducts, 200×. Myoepithelial cell layer disruptions and ER-negative cell clusters are identified with arrows. Multiple myoepithelial cell layer disruptions and overlying estrogen receptor (ER)-negative cell clusters in ductal carcinoma in situ. (a) A paraffin section immunostained for ER (brown) and smooth muscle actin (SMA) (red), 200×; (b) a higher magnification of (a), 400×; (c) a paraffin section immunostained for ER (brown) and SMA (red), 200×; (d) a higher magnification of (c), 400×. Myoepithelial cell layer disruptions and ER-negative cell clusters are identified with arrows. Although more than 86% of the myoepithelial cell layer disruptions were overlain by ER-negative cell clusters, nearly 14% of the disruptions were subjacent to ER-positive cell clusters. These ER-positive clusters were generally distinct from ER-negative cell clusters in three aspects: most of the clusters occurred in ducts with markedly attenuated myoepithelial cell layers, they usually showed no alterations in cell shape, density, or polarity, and the surrounding stromal tissues displayed no distinct morphological alterations (Fig. 5). Myoepithelial cell layer disruptions and associated estrogen receptor (ER)-positive cells in hyperplastic ducts. All sections were immunostained immunostained for ER (brown) and smooth muscle actin (red). (a), (b) Two ER-positive hyperplastic ducts showing attenuated and disrupted myoepithelial cell layers, 200×. The disruptions are identified with arrows. The myoepithelial cell layer disruptions and their associated ER-negative cell clusters occurred in ducts with DCIS or atypical intraductal hyperplasia in 90.6% of the cases. In 9.4% of the cases, however, myoepithelial cell layer disruptions and associated ER-negative cell clusters were seen in hyperplastic, and even normal appearing, ducts (Fig. 6). Myoepithelial cell layer disruptions and overlying estrogen receptor (ER)-negative cell clusters in normal and hyperplastic appearing ducts. All sections were immunostained immunostained for ER (brown) and smooth muscle actin (red). (a)–(c) Normal appearing ducts, 400×; (d)–(f) hyperplastic ducts, 400×. Myoepithelial cell layer disruptions and ER-negative cell clusters are identified with arrows. All the ER-negative cell clusters overlying the disrupted myoepithelial cell layer and their adjacent ER-positive counterparts in all 20 cases showed distinct immunoreactivity to cytokeratin 8, cytokeratin 19, and cytokeratins AE1/AE3, suggesting that they are epithelial in nature (data not shown). Immunostaining with antibodies to collagen IV and laminin revealed no distinct immunoreactivity surrounding disrupted myoepithelial cell layers, suggesting that the basement membrane was also disrupted (data not shown). The ER-negative cell clusters were either in or protruded from the epithelial component. Molecular analyses on microdissected cells from the five selected cases revealed distinct LOH and MI in both ER-negative cells and adjacent ER-positive cells within the same duct at each of the 15 DNA markers. The frequency of LOH and MI among the DNA markers, however, varied from 12% to more than 70%. The ER-negative and ER-positive cells showed a different frequency or pattern of LOH and MI at 10 of the 15 markers, including those at chromosomes 3p, 11p, 13q, and 16q. Figure 7 shows examples of the LOH pattern in ER-negative cells and adjacent ER-positive cells from a selected case. Subsequently, and currently, additional cases with ER-negative cell clusters overlying disrupted myoepithelial cell layers were selected for a larger scale comparison at a wider spectrum. The preliminary results are in agreement with those seen in the five previously selected cases. The detailed findings in all these cases will be pooled and reported separately. Comparison of the loss of heterozygosity (LOH) pattern in estrogen receptor (ER)-negative cells and adjacent ER-positive cells within the same duct. (a) H & E staining of a duct with atypical intraductal hyperplasia, 200×; (b) the adjacent section of (a) immunostainined (before microdissection), 200×; (c) microdissection of ER-positive cells; (d) microdissection of ER-negative cells; (e) LOH at four selected DNA markers. Asterisks indicate the ER-negative cells and the ER-positive cells removed; arrows identify LOH. The myoepithelial cell layer has been traditionally regarded as a structural barrier for separating mammary epithelial cells from the surrounding stroma and for contracting ductal and lobular spaces assisting milk secretion [25, 26]. Recent studies, however, have revealed several lines of evidence suggesting that myoepithelial cells may play active roles in preventing in situ tumors from invasion, and in regulating the functions of the epithelial cells. First, normal myoepithelial cells secrete several cell growth inhibitors, including maspin, which inhibit tumor cell growth in both tissue cultures and in animal models [27–29]. Second, normal myoepithelial cells can convert precursor hormones into active steroid hormones within the mammary epithelial tissue . Third, the protein of a tumor suppressor gene, Wilms' tumor 1, is colocalized with maspin exclusively in myoepithelial cells, and the expression of these two proteins is linearly decreased with tumor progression in a vast majority of the cases assessed [10, 11]. The loss of maspin and Wilms' tumor 1 expression or the disruption of myoepithelial cell layers leads to a significantly higher epithelial cell proliferation [10, 11]. On the other hand, recent studies have suggested that myoepithelial cells could be the specific target of external and internal insults and could be subject to a variety of normal and pathologic changes. The exposure to lambda carrageenan could specifically result in the filament disassembly and loss of the mammary myoepithelial cells, whereas exposure to oxytocin could markedly enhance the myoepithelial cell differentiation and proliferation [31, 32]. Our recent study has further demonstrated a subset of myoepithelial cells that are morphologically distinct on H & E sections, but are devoid of expression of nine phenotypic markers that are supposed to be exclusively or preferentially expressed in myoepithelial cells . Despite this recent progress in myoepithelial cell research, the cell kinetics of myoepithelial cells has not been elucidated, and the mechanism of myoepithelial cell layer disruptions remains elusive. Based on our recent findings, we hypothesize that disruptions of the BM and myoepithelial cell layers and tumor invasion may be initiated or mediated by myoepithelial cells. Our hypothesized mechanism and the involved processes are as follows. Normal myoepithelial cells frequently undergo proliferation and differentiation to replace aged or injured cells. An external or internal insult then disrupts the normal replacement process, resulting in a cluster of dying myoepithelial cells. Following this, degraded products of dead myoepithelial cells attract lymphocyte infiltration that physically disrupts the BM. A focal disruption in the myoepithelial cell layer and the BM layer then results in an increased permeability for metabolism-and growth-related molecules. The altered microenvironment results in the changes of the gene expression pattern and the behavior of the adjacent epithelial cells, facilitating the formation of a biologically more aggressive cell clone. Epithelial cells overlying disrupted myoepithelial cell layers then undergo a localized epithelial cell proliferation, which may occur in two forms: stem cell mediated proliferation that gives rise to ER-negative cell clusters, and differentiated cell mediated proliferation that produces ER-positive cells. Finally, cells overlying disrupted myoepithelial cell layers undergo cytodifferentiation, releasing stage-restricted and invasion-associated molecules, which trigger angiogenesis, tissue remodeling, and increasing production of growth factors in the stroma, providing a favorable environment for epithelial cell growth [34–36]. These interactive changes between epithelial and stromal cells lead to further degradation of the BM and myoepithelial cell layers, and a clonal expansion and stromal invasion of cells overlying disrupted myoepithelial cell layers. Our hypotheses appear to be supported by the results of two recent studies showing that the frequency of white blood cell infiltration into the tumor tissues seems to linearly increase with tumor progression [37, 38]. Our hypotheses are also in an agreement with the results of our most recent study, which reveals that ducts with focally disrupted myoepithelial cell layers have a significantly higher rate of white blood cell infiltration and more clusters of multiple proliferating cells compared with morphologically comparable ducts without myoepithelial disruptions (unpublished data). It is not known, however, whether or to what extent our hypothesis reflects the intrinsic mechanism of the BM and myoepithelial cell layer disruptions. However, given the fact that the disruption of the BM and myoepithelial cell layers is an absolute prerequisite for tumor invasion, and that progression of breast tumors is paralleled by a progressive hormonal independence [14–17], our hypothesized model might open a new window for exploring these issues. The mechanism for the loss or diminution of ER expression in cells overlying a disrupted myoepithelial cell layer is unknown, but could result from several reasons. First, these cells might be in the status of actively proliferating. A previous immunohistochemical study in human breasts has shown that none of the epithelial cells with ER expression and progesterone receptor expression was proliferating, and none of the proliferating cells showed either ER or progesterone receptor expression . Second, the ER gene in these cells might have been inactivated by methylation during tumor progression. Previous studies have shown that the progression of breast tumors is paralleled by a progressive hormonal independence [14–17]. Third, these cells might express a different type of ER, including variants of the β-ER. A recent study has revealed that α-ER and β-ER are separately localized in a subset of breast tumors and appear to have different functions . Fourth, these cells might be derived from the myoepithelial lineage. A number of previous studies have shown that myoepithelial cells can express partial myodifferentiation in human breast cancer [41–43]. Finally, these cells are newly formed through a stem cell mediated clonal proliferation and are not mature enough to express the ER protein. Previous studies have demonstrated that the ER expression status is related to the age or differentiation status of the cells [25, 44]. While each of these five assumptions could partially explain the loss of ER expression in cell clusters overlying disrupted myoepithelial cell layers, a stem cell mediated clonal proliferation appears to be a more reasonable interpretation, as our most recent studies on the same tissues used in the current study have further revealed several new features of these ER-negative clusters: negativity to p-cadherin, a newly introduced specific myoepithelial cell marker; strong immunoreactivities to epithelial-specific antigen; lost or markedly reduced expression of p27, a cell growth inhibitor; and a unique rate and pattern of cell proliferation-related proteins [45, 46]. It is also possible, however, that these ER-negative clusters represent the intermediate cells of a myoepithelial lineage, as our previous study has revealed that a subset of morphologically distinct myoepithelial cells is devoid of the ER and also a total of nine markers that are supposed to be exclusively or preferentially expressed in myoepithelial cells . In any case, the loss or reduction of the ER, along with a different pattern of genetic alterations, suggests that the ER-negative clusters and their adjacent ER-positive counterparts may have substantially different genetic and biochemical profiles. Consequently, comparisons of these two cell populations at DNA, RNA, and protein levels may lead to identification of very specific biomolecules that are exclusively associated with myoepithelial cell layer disruptions and tumor invasion. These molecules might be used for development of vaccine or biomarkers for early detection, treatment, and prevention of breast cancer . A total of 405 focal disruptions in the myoepithelial cell layers were detected from 5698 duct cross-sections of 94 patients with DCIS. Of the 405 disruptions, 350 (86.4%) were overlain by ER-negative cell clusters and 55 (13.6%) were overlain by ER-positive cell clusters (P < 0.01). The microdissected ER-negative and ER-positive cells within the same duct from all five selected cases showed a different frequency or pattern of LOH and/or MI at 10 of 15 markers. The loss or reduction of ER expression, along with a different pattern of genetic alterations, suggests that the ER-negative cell clusters and their adjacent ER-positive counterparts might have substantially different genetic and biochemical profiles. The opinions and assertions contained herein represent the personal views of the authors and are not to be construed as official or as representing the views of the Department of the Army or the Department of Defense. The authors are grateful to Doug Landry and James A Nola of the Armed Forces Institute of Pathology exhibition section for their technical assistance in preparing the figures. This study was supported by The Congressionally Directed Medical Programs, grants DAMD 17-01-0129 and DAMD17-01-0130 (to Y-gM).